1 The material history of an artist’s work can enrich our appreciation of an artist’s oeuvre and painting methods. Art historians preoccupy themselves mostly with the intellectual relationship of the various steps involved in the creation of an image from quick to finished sketches to larger more finished works. Art historical research into artists’ papers and archives can reveal seemingly unimportant information about the artist’s practice and materials and this information is too often overlooked and undervalued. Conservation research has the capacity to add another dimension to the full understanding and interpretation of a work through examination and scientific analysis that constitutes its material history. Such research can clarify difficult issues relating to dating, authenticate problematic works, and identify significant changes in the artist’s working methods. By combining these two areas of art historical and conservation research we have the unique opportunity to better understand the significance of the material history of a work in relation to its intellectual significance. The case of Anthony C. Law (1916–1996) is most revealing. 3 In 1936, Law returned to Quebec City and studied with Percyval Tudor–Hart. He had his first exhibition in 1937 in Quebec City. By all accounts the fifty canvases Law exhibited established him as a talented young artist who did not shy away from strong colours.2 His artistic vision of Canada’s landscape resulted in a number of prizes for his works such as the Montreal Art Association’s Jessie Dow Prize in 1939 and again in 1951.3 By the outbreak of the Second World War, Law was an accomplished artist who was determined to serve his country by joining the navy and to continue painting in unfamiliar territory. He intended to visually record his experiences aboard motor torpedo boats in North Atlantic waters and leave a legacy of these events to future generations through his paintings and drawings. He was first appointed an official war artist in 1943 and official naval war artist in 1945. 4 Throughout the war years, Law had his sketchbook, art materials and paintbox at his side. This paintbox is now in the permanent collection of the Canadian War Museum and is an important artifact in relation to Law. It bears the scars of battle in terms of poor condition but provides a significant amount of historical data on Law’s working methods and materials. In addition to the paintbox, the Canadian War Museum also has numerous small paintings on wood panel of his, which are considered working sketches for his larger canvas paintings. Many of these small sketches correspond to the usage dates of the paintbox and were likely produced in the easel section of his paintbox. To find both Law’s paintbox and sketches at one institution allowed for a detailed comparative analysis of components found on both to be undertaken. I have taken the liberty to send you my old paint box…The box is in bad shape but it covers a lot of history. 6 The paintbox is a combined sketch box and slotted easel with telescopic legs. The multi-functional aspect of this paintbox design allowed Law to quickly record events of action at sea. It is portable and can be used for both indoor and outdoor work. 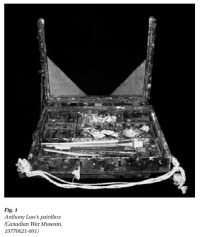 This seems to be Law’s preferred style of paintbox, since this style is seen in many photographs of Law painting outdoors. 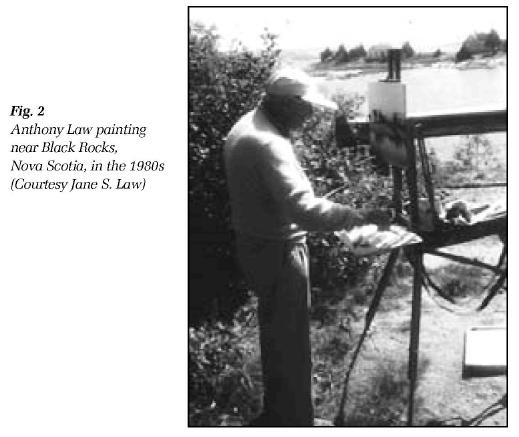 Law followed the traditional "plein air" style of painting pursued by the Group of Seven (Fig. 2). 7 The paintbox measures 44 cm wide, 36 cm deep and 6 cm high. It is constructed primarily of wood and metal, with a replacement handle made of jute. The top face of the cover is missing, including the front panel, which would have latched to the base of the box. The two triangular shaped wooden sections found at each bottom corner of the lid appear to be more recent additions. There is a metal plaque along the left side of the box, which is riveted to the box and has relief printing that states: OTHER WAY; CHICAGO; KEEP COVER ON BOX. The top lid, which now consists of only the easel frame and triangular wooden sections, is hinged and functions as an expandable easel, which can hold up to four panels measuring approximately 33 cm high, 39 cm wide and 6 mm deep. If the easel is expanded it can hold panels up to 66 cm wide. 8 The interior of the box consists of six crimped metal storage compartments to hold paints and tools and there is a ledge above the storage compartment to hold the palette. The palette is secured onto this ledge by slipping it face up under three small metal clips at the back of the box and moving two rotating clips over the front of the palette. The secured palette has sufficient clearance in the paintbox to avoid contact of any material with wet paint on the palette. 9 The bottom of the box holds three folding telescopic legs that can be extended and tightened when required and secured onto the bottom of the box with metal clips when not in use (Fig. 3). 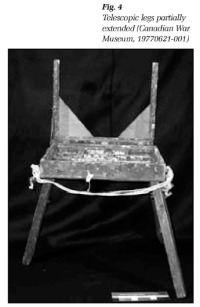 When extended to their full length, these telescopic legs support the paintbox to a height of approximately 94 cm and allow the artist to work in a comfortable standing position (Fig. 4). The legs also have metal stakes at the end of each leg, which can be used to firmly plant the legs in the ground (Fig. 5). Fig. 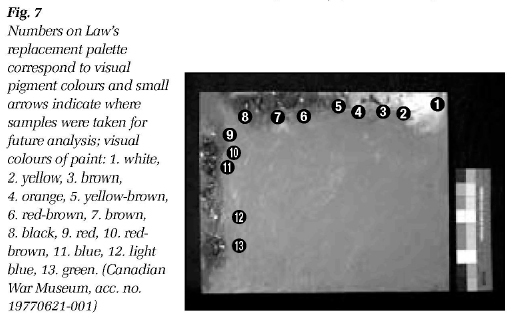 7 Numbers on Law’s replacement palette correspond to visual pigment colours and small arrows indicate where samples were taken for future analysis; visual colours of paint: 1. white, 2. yellow, 3. brown, 4. orange, 5. yellow-brown, 6. red-brown, 7. brown, 8. black, 9. red, 10. red-brown, 11. blue, 12. light blue, 13. green. 12 The replacement palette is made of rough, three-ply wood and measures 33 cm by 41 cm and is 6 mm thick. The oil colours found on the replacement palette indicate a series of warm hues along the top, horizontal side of the palette (includ ing white to the far right of the row and black to the far left) and cooler hues along the left, vertical side of the palette. From earliest times, when painting techniques were passed on from master to apprentice, they were conveyed in an orderly manner. Apprentices were taught to "set the palette" or arrange the colours in a particular sequence on the palette. This methodology was kept secret within artists’ guilds and few manuscripts were widely available on painting technique. 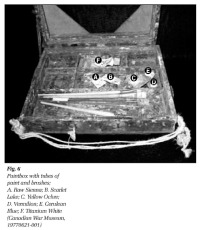 As published information on painting technique became more widespread and artists travelled and shared information, we find precise references to the preparation of the palette. One early published and illustrated account of "setting the palette" can be found in the De Mayerne Manuscript of 1620. It states that the lightest colours should be placed along the top and darker colours lower down on the palette.9 It is likely that Law was trained in such a traditional method of preparing a palette since there is a systematic and conscious application of colours on his palette. In consulting three colour photographs of the artist painting outdoors, this same colour arrangement is clearly visible on each palette and, additionally, he attached a small metal cup along the upper left edge of the palette, presumably to hold solvent. Law also put down a thin, grey, neutral tone scumble in the centre of his palette, which was allowed to fully dry. More accurate colour mixing is achieved on top of this layer. Tube applications of oil colours were placed along the top and left side of the palette. 13 Law produced his finished paintings on canvas by first sketching on a small wood panel, producing the sketch "on the spot. "10 These images would later be "copied" on a larger scale to canvas. Usually these small panels fit into the easel component of his paintbox lid. Of the fifty panels examined at the Canadian War Museum, all were on wood panel except for one, which was on artists’ board and not included in this study. Of the remaining panels, one wood panel was too wide to fit in the easel and two wood panels were too small to be securely held in the paintbox easel and these works were also eliminated from this study. A total of forty-six panels were included in this study. Although some of the panels are undated, the majority were painted between 1943 and 1945, therefore conforming to the dates that the artist would have been using the paintbox. 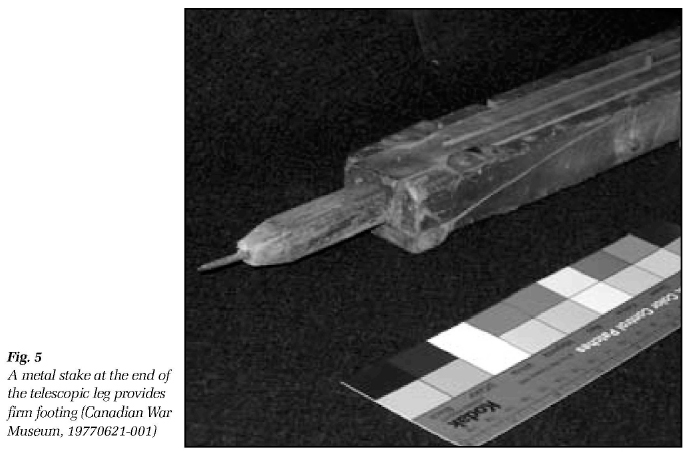 16 In order to establish a physical link between the use of the paintbox and production of the Canadian War Museum’s panels, a comparative analysis of components found both on the panels and paintbox was undertaken. Each of the forty-six panels was systematically placed into each of the four slots of the paintbox easel and the width of the easel was adjusted for each panel (Fig. 10). Of particular interest during this stage of the examination was the unique buildup of paint deposits along the inner edges of the four slots in the easel. 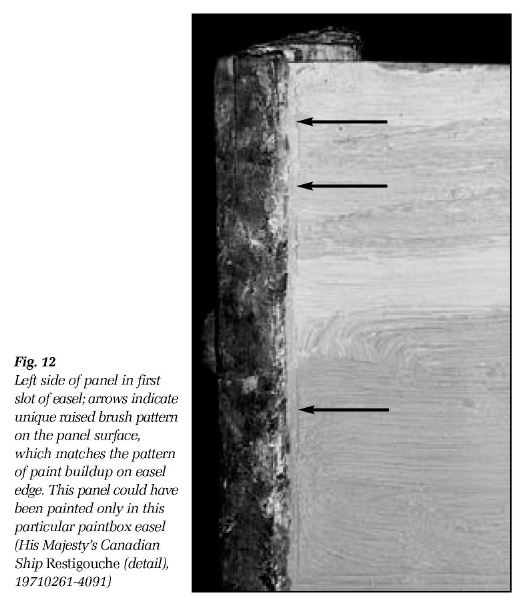 The hypothesis was made that this unique pattern of paint buildup could be matched to brush mark patterns and paint ridges found on the front of Law’s panels. 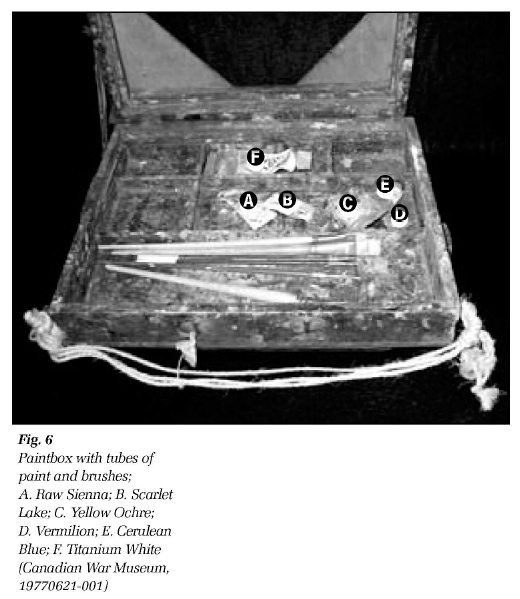 If the pattern of paint buildup on the easel and brush mark patterns and ridges on the panel matched, it would confirm that the panel had been painted in the easel component of this paintbox. Fig. 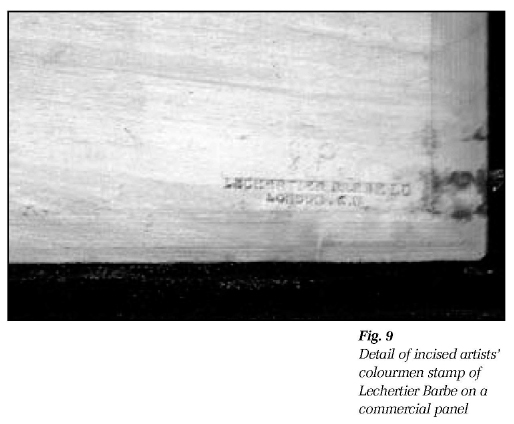 8 Cross-section of one of the thirty-three panels on three-ply wood; the lower ply has been bevelled at the edge and is barely visible. Fig. 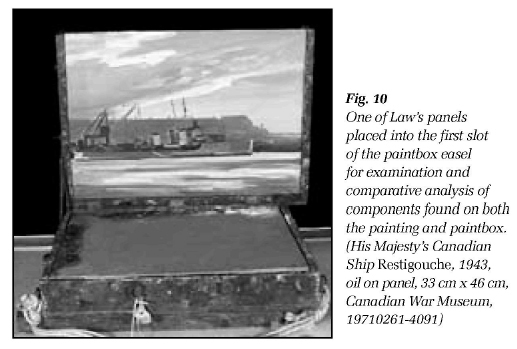 10 One of Law’s panels placed into the first slot of the paintbox easel for examination and comparative analysis of components found on both the painting and paintbox. 17 In preparation for painting, Law would slide his linseed oil prepared panel into one of the four available slots in the easel component of his paint box. If required, he would adjust the width of the easel by extending the right, movable part of the easel (Fig. 10). The edges of the inserted panel were covered by the edge of the slot by approximately 6 mm. As Law painted, his brush would occasionally hit the inner edges of the easel’s frame, depositing a small amount of oil paint in this area. As time went by, these deposits formed a unique pattern of paint along the vertical sides and bottom edge of each of the four slots (Fig. 11). 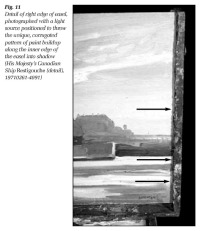 The panel shown in Figures 10, 11 and 12 was positively identified as having been painted in the first slot of the easel (slot closest to artist) by matching up the unique pattern of paint deposited on the edge of the easel and a series of brush mark ridges found on the panel (Fig. 12). 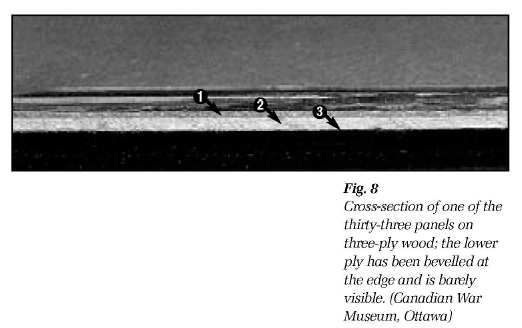 The arrows in Figure 12 clearly show where the patterns of paint deposits on the edge of the easel and brush mark ridges on the painted panel are identical. 19 First and foremost this study provides intimate information about the artist’s materials and his specific working methods. We have clearer information on how he produced his quick sketches, often at sea using his paintbox. The study of his replacement palette and preferred colours bring to life a clarity, often forgotten or obscured, of his experience as a practising artist. 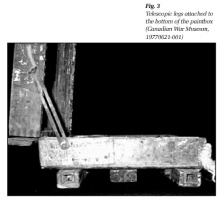 We accept that some materials found in the paintbox may not be contemporary to the creation of the associated panels because the box had been out of Law’s hands for some time before it came into the collection of the Canadian War Museum. Fortunately, there was still sufficient original material evidence on the easel component of the paintbox to allow comparative work to the undertaken in order to definitively match many of Law’s sketches to the use of the paintbox. By bringing Law’s sketches and paintbox together we are reconstituting the site of Law’s orderly artistic practice. It is like entering the private studio of the artist, which remains a personal and intimate experience. The author would like to thank Laura Brandon, Curator, Canadian War Museum and Gilbert Gignac, Library and Archives Canada, for their advice and valuable suggestions to this manuscript. Thanks are also extended to Helen Holt, Canadian War Museum, for allowing access to the paintbox and paint sampling and to Alison Murray, Queen’s University, for her generous scientific advice. Finally, I would like to thank Mrs Jane S. Law for sharing information about her husband’s life and for providing photographs. 1 Bernard Riordon, C. Anthony Law: A Retrospective (Halifax: Art Gallery of Nova Scotia, 1989), 9. 3 Wallack Galleries, Anthony Law (Ottawa: Wallack Galleries, 1988), Exhibition Brochure, p. 1. 4 Anthony Law, letter to Hugh Halliday (Curator of War Art, Canadian War Museum), 15 November 1977, Canadian War Museum, Ottawa. 6 Anthony Law, letter to Hugh Halliday (Curator of War Art, Canadian War Museum), 15 August 1977, Canadian War Museum, Ottawa. 7 Law, letter to Halliday, 15 November 1977. 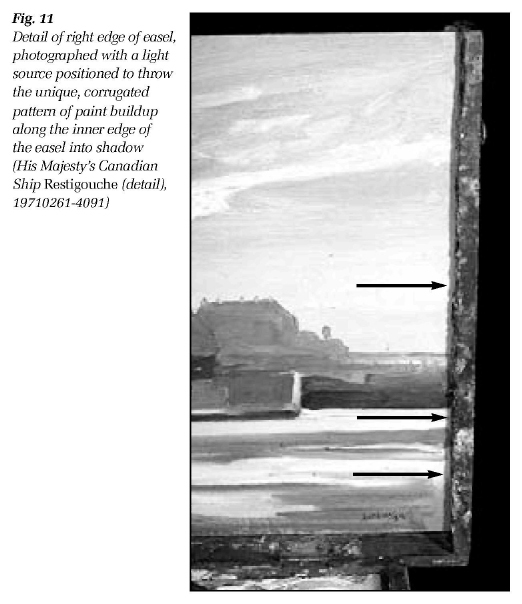 9 E. van de Wetering, "Reflections on the Relation between Technique and Style: The Use of the Palette by the Seventeenth-Century Painter," in Historical Painting Techniques, Materials, and Studio Practice, Proceedings of a Symposium at the University of Leiden, 26–29 June 1995, edited by Arie Wallert et al. (Los Angeles: Getty Conservation Institute, 1995), 199. 10 Anthony Law, interview with Laura Brandon, video-cassette, Canadian War Museum, Ottawa, 12 November 1994. 11 Catalogue of Oil Paints available from Lechertier Barbe Ltd., Artists’ Colourmen, London, annotated by Sir William Nicholson (Churchill Archives Centre, University of Cambridge, CHAR 1/296/3, 1936), www.archives.chu.cam.ac.uk, 12 September 2004. 12 Law, interview with Laura Brandon. 17 Law, letter to Halliday, 15 November 1977.